How can women-led SMEs in Kenya’s semi-arid lands build resilience to climate change? 26 Jul, 2017 | filed under Blog. Semi-arid lands (SALs) in developing countries are climate change ‘hot spots’ – or areas where climate change is having grave impacts, such as longer and more frequent droughts. This creates new challenges for jobs and livelihoods in these areas. PRISE Project 4 on ‘Enabling environment for private sector/multi-stakeholder action to strengthen resilience to climate change‘ investigates how the private sector in some of these regions, including businesses owned and run by women, can adapt to climate change and take advantage of new opportunities. Our research reveals that female business owners in Narok County (one of Kenya’s 47 counties and located in a semi-arid area of Kenya’s Rift Valley region) are more vulnerable to some of the risks of climate change than their male counterparts, due to strong socio-cultural norms around gender roles and resource use and access. Most women in Kenya’s SALs run or own agriculture-based Micro, Small and Medium Enterprises (MSMEs) – like small scale trade in cereal, milk and poultry products – all of which are directly affected by climate change. The women we spoke to said climate impacts, such as drought and climate-related livestock disease, lead to losses to their business assets and reduced growth. Climate change also leads to a range of broader problems. During drought, men in Narok are forced to sell off land at ‘crisis’ values, far below the actual value of the land. This way of coping can have a debilitating impact on MSMEs led by women, because the money families receive from land sales is rarely invested into female businesses and selling off land means it can no longer be used for farming, or as security to access credit from micro-finance institutions. Participants at the PRISE Project 4 focus group on enabling climate change adaptation among female entrepreneurs in Narok, Kenya. PHOTO: PRISE. Women who own MSMEs in Narok have few options to strengthen their businesses against the negative impacts of climate change. Apart from using community banking and lending networks, they largely depend on reducing stocks at times of water shortages. Tomato traders from Narok South described being forced to cut production by more than half, to limit the area of land that needs to be watered, and so reduce their risk of loss and damage. Though these kinds of strategies may help businesses to cope in the short term, over time, reducing stocks and production may prove counter-productive, as the resulting loss in profits and business may limit the resources that women have available to help them to cope with future climate change impacts. What limits adaptation options for women-led MSMEs? MSMEs in sub-Saharan Africa face business challenges including underdeveloped infrastructure and limited access to finance, technology, markets, skilled labour and information services. Yet cultural constraints and traditionally ‘institutionalised’ gender roles can also prevent female-led MSMEs in Kenya’s SALs from adapting to climate change, by limiting their access to technology, information and financial resources. For example, a partnership between Kenya Hives Limited, the Maasai Mara Bee Keepers Association and bee keeping entrepreneurs in Narok develops market links and provides capacity building services around bee-hive management. This includes training women beekeeping entrepreneurs to improve harvest quality to increase production and profit. But when field officers visit homes to offer on-farm demonstrations of new technologies, like the use of modern bee hives, they are often only allowed to speak with female entrepreneurs with the permission of the women’s husbands. In contrast, some women in the Maasai Mara Beekeepers Association have broken through these cultural barriers. These entrepreneurs have been able to access and use modern hives which, because they can be moved from region to region, are more responsive to climate change. The hives are also easier for women to manage because they do not have to be mounted on top of a tree. These women have been able to increase their honey production and sales in the face of climate change, and have become major suppliers of honey in Narok and surrounding areas. Crucially, most of the women benefiting from these hives have had better educational opportunities and more exposure to training seminars, allowing them to learn, share experiences and establish networks and partnerships. Kenya recognises the need to mainstream gender equity in various national policies, including the Climate Change Act. Many women also hope that Kenya’s procurement act, which ring-fences one third of government tenders for women, young people and those with disabilities, could also help to break down cultural barriers and spur robust and resilient financial, technological and knowledge opportunities for women entrepreneurs. Yet even these broader policies are inadequately implemented, monitored and enforced. In development meetings, where concerns around poor policy implementation can be aired, generally only a small number of ‘elite’ women – who can speak and understand policy language – attend. 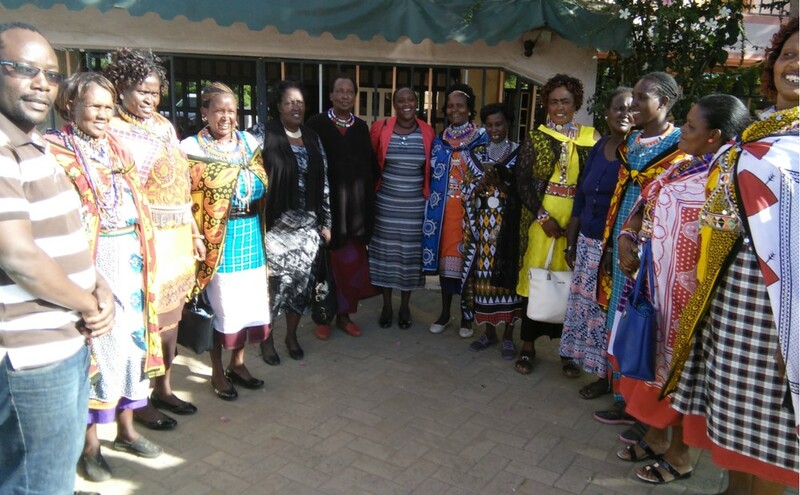 Often these women have lived their lives and attended school outside Narok, which may limit their ability to accurately represent the context and experiences of local women. More national policies on gender may not be the answer to dismantle socio-cultural barriers to inclusive private sector adaptation. Instead, maybe the way forward requires a move away from simple policy statements, to designing and reinforcing clearer and more inclusive implementation platforms, which ensure that the broader enabling frameworks, established in national policy, are mainstreamed and implemented at ground-level.